K-1 kerosene, for your convenience, we have a pump at our office on Main Street in Chippewa Falls. We also have pails or 55 gallon drums of K-1 kerosene available. We deliver within a 30 mile radius which includes Chippewa County, Eau Claire County, Dunn County, Clark County and Barron County. 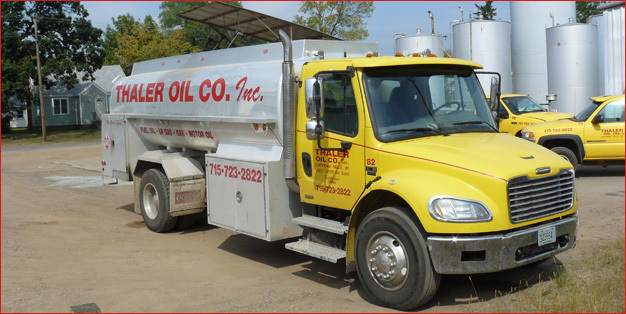 At Thaler Oil, we deliver propane to customer owned tanks and Thaler Oil leased tanks. We deliver propane within a 50 mile radius of Chippewa Falls including the following counties: Chippewa, Eau Claire, Dunn, Barron, St. Croix, Trempeleau, Clark, Pepin, Buffalo, Jackson, Taylor and Rusk counties. 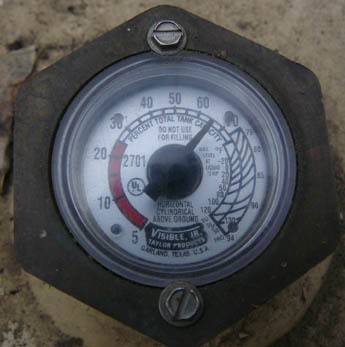 This is a typical propane tank gauge. When it reads 20% you should order your propane -- this will give us plenty of time! We can fill the tank to 80% full. We fill propane cylinders at our office in Chippewa Falls from 5#-100# cylinders. You can also fill propane cylinders at our company owned Express Mart convenience stores throughout Western Wisconson. CLICK HERE to locate your nearest Express Mart! Propane (also called LP gas) is liquefied petroleum gas. In most systems, propane is vaporized to a gas before it leaves the tank. Propane is flammable when mixed with air and can be ignited by many sources, including open flames, smoking materials and sparks. Propane smells like a rotten egg smell. If you smell gas, leave immediately and contact a qualified service technician. You should also turn the gas off at the tank. Propane gas detectors can provide additional measures of security. At Thaler Oil, we supply cases, pail, gallons, drums and bulk lubricants. We also carry some Mobil, Citgo, Phillips, Valvoline and Quaker State products call for our current inventory! We have also have K-1 kerosene, methenol, isopropyal, antifreeze and windshield washer fluid available at our office. We also deliver! Prices and delivery radius varies so please call to order.